When LED stick are charged with light, they will glow brightly in the dark! 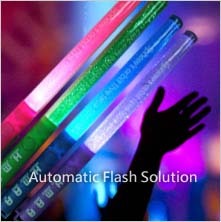 The LED stick are designed for signing in the dark for the party or concert, you can control it by remote controller or computer software. We are specialized in producing many kinds of LED creative products. We are famous for our superior quality, competitive prices, first-class craftworks, safe package and prompt delivery. Therefore, we can fully satisfy your demands. Besides our own products, we provide OEM services and accept customized orders as well. Our products are popular in overseas markets because we supply good products with diversified designs and professional services. 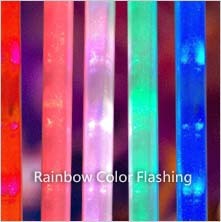 * Single or colorful LED -with flashes various colors designs. * The color of the grip can be customized for customers' requirements. * Controled by remote controller or computer software. * When use Computer-controlled wireless transmitter (with remote control software),the transmitter control distance will be 500M. Flash stick is within the control of all the received signals. * 3 AAA batteries, battery discharge 6 hours. 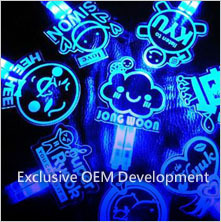 * Exclusive development, the super bright in dark is your prefect gifts for concert or party. When you use LED stick with Computer-controlled wireless transmitter (with remote control software), the transmitter control distance will be 500M. Flash stick is under the control of all the received signals. LED stick can controled by remote controller or manual control. 1 x remote control can control within 300 meters of the 3000 LED sticks. Just open the switch, LED stick will shine automatically. We are professinal at design for many different LED stick style. They have different fuctions to make you have fun in happy time. Exclusive OEM or ODM development. Super bright in the dark is your prefect gifts for concert or party. 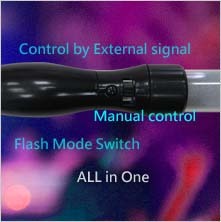 All in one design LED stick can not only controled by remote controller or computer software, but also can used by manual control. Single or colorful LED -with flashes various colors designs. You can set up 12 changeable flash mode.